1.025,00 EUR 19 % VAT incl. Blockage free ESM communal bar of 107, 117 or 122 cm in length. Tell us the desired length of the cutter bar. Convenient blade change by raising the spring lever. 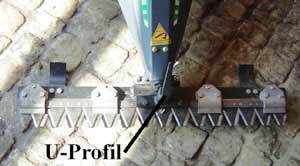 As mowing drive we use a pendulum professional mower drive. The mower drive is via ball-bearing drive elements. 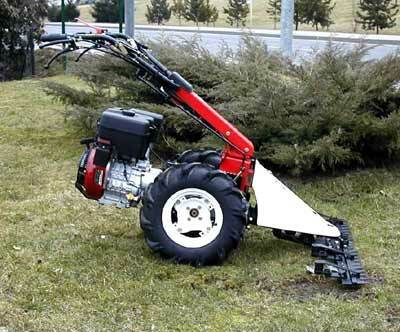 The mower drive arm pulls the upper blade back and forth without occuring lateral forces. The stability and quality of the Italian bar is not very good. We can buy a cheap hobby bar from ESM, but the effort of setting and blade change is very complicated. As cutter bars we only use ESM communal oscillating lever bars. Although this is the most expensive bar but also the best. By the spring pusher, a uniform pressure from the upper blade is based on the lower blade, and thus the cutting quality is better. If the upper blade need to be changed once, you only need to push spring arm up and lock and the blade/knife can be changed quickly. An elaborate setting of the upper blade is eliminated.